I'm using the data acquisition toolbox and NI hardware to acquire data into MATLAB. I have installed all the latest drivers, toolbox and matlab versions and all my hardware devices are supported except for the cDAQ-9185 chassis. I have no problem creating sessions but I get the plug-in error when I try to add analog input channels. I don't think that the cDAQ-9185 Chassis is the problem because I can add analog output channels and occasionally I'm able to add analog input channels. I don't know what the problem is so any help is much appreciated. Error: Failed to load device plug-in: 'mwnidaqmxai'. Check that the DAQ Toolbox and NIDAmx drivers are installed properly. What MATLAB version are you running? What version of NI-DAQmx is installed on the machine? I have the same issue. I am using "NI USB-6009" ONLY. The Data Acquisition Tool supports this device. And the version of NI-DAQmx is 18.0. I have tried an following example of Mathworks Website. But following error occurs when "addAnalogInputChannel" function is executed. Failed to load device plug-in: 'mwnidaqmxai'. Check that the DAQ Toolbox and NIDAQmx drivers are installed properly. I am still suffering this issue. The reason I upgraded to the 18 version was because I thought the 17.1 version of NI-DAQmx was the not compatible with r2018. But as it turns out, the version of NI-DAQmx isn't what's causing the problem. I followed these instructions, and am still getting the same issue. Occasionally, it works but I don't believe I'm doing anything different. I have the same problem. I talked to Mathworks support and they said the reason was because my cDAQ-9185 chassis is not supported by Matlab. To resolve this issue you can upgrade/update to R2018b Update 1. Please refer to the following bug report for a possible temporary workaround in R2018a. You can also opt in to receive automatic notifications when a fix is available for R2018a. Yes, please take a look at this bug report. They accurately describe the problem, at least in my case. I get this error when I try to que too large a vector (~ few GB) to the analog out. If I decrease the size of the vector it works fine. So it seems the error code is largely unrelated to the actual cause. I have the same problem. Also after I uninstalled NI_DAQmx version 18 and installed NI_DAQmx version 17.1. I use a NI PXIe 6363 and a NI PXIe 6238 and Matlab 2018a. Does somebody have a solution for this problem? I found a countermeasure to reduce the occurrence frequency of this issue (NOT a perfect countermeasure). Even after this countermeasure sometimes the same issue occurs, but the occurrence frequency of this issue is very low on my PC. This countermeasure is for Microsoft Windows only. Refer to following image also. 1. Launch the "System Configuration"
3. Sort by manufacturer (Blue Box in the image). 4. 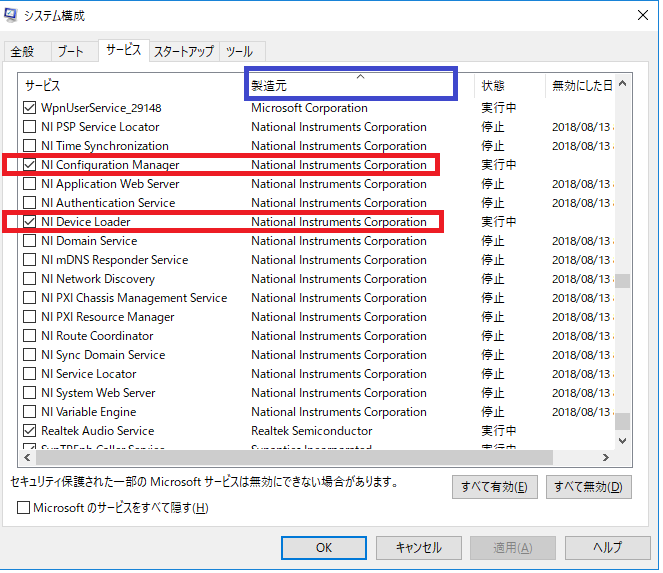 Find the service of National Instruments. 5. Originally, the all services of National Instrument are turned on. Turn OFF these services except Red box in the image. 6. Click the OK button on the system configuration. These countermeasures unfortunately do not have any positive effect on my system. I am facing the same issue on Windows 10 while using NI USB-6221oem. This device is supported by Matlab. The problem arises when I am trying to add an Input or Output channel. It used to happen once or twice in a day, all other times it used to work perfectly in the last 2 months that I have used this NI device. Recently, in the last couple of days, it started to happen more frequently, but I was able to get rid of this issue by restarting my computer. However, from today, even the restarting the Windows doesn't help. Can you contact me directly to investigate this issue? Have anyone solved this problem? I am facing the same problem using USB 6211 NI-DAQmx version 18.1 , Matlab 2018a and window 10. I could load analog output and digital output channels but problem to load analog input channels that give : failed to load device plug-in: 'mwnidaqmxai'. check that the daq toolbox and nidaqmx drivers are installed properly. Hi Abdul, I had similar problems recently with my NI USB 6221 oem device. This is caused by low amount of RAM in your system. Try closing all the applications (especially Chrome) and then load the input channels, keep an eye on the amount of RAM being used through Task Manager while doing this. Abdul, please refer to the bug report mentioned in the following answer; a possible workaround is described, and you can follow the bug report to get notified on when an actual fix is available.